President Yudhoyono appears to be on the way to a striking victory in Indonesia's election and this not very well followed country continues to attract some fans. 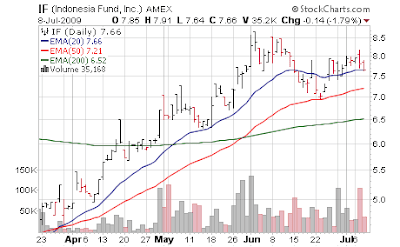 With the caveat that if Western markets take another plunge this summer, that emerging markets most likely will follow - this country continues to intrigue me over the longer run. 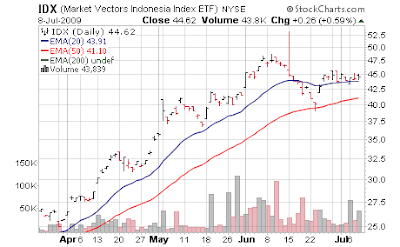 Thus far in this correction, the major ETFs for Indonesia have held support well. President Susilo Bambang Yudhoyono swept toward a second five-year term, receiving a strong mandate from Indonesia’s 176 million voters to take the country’s economy to new heights of growth. Yudhoyono, better known as ‘SBY,’ won 61 percent of votes in yesterday’s election, according to a sampling of nationwide ballots by the Indonesian Survey Institute, which correctly predicted previous contests. Leveraging that victory into achieving his goal of growth rates on par with China and India will hinge on the ability to build roads, ports and power plants and lure foreign investment. To do so, he’ll have to overcome a bureaucracy where power is decentralized down to the district level across 17,500 islands. Fixing Indonesia’s congested roads, neglected ports and aging power plants needs to be among Yudhoyono’s top priorities, according to nine of 11 chief executive officers contacted in the past month by Bloomberg News. He also needs to improve transparency in the legal system and reduce corruption to attract global investors, the survey found. Indonesia ranked 86th out of 133 economies in terms of infrastructure quality in the World Economic Forum’s 2008 Global Competitive Index. That was lower than Pakistan, which faces almost daily attacks by terrorists, and Sri Lanka. While Indonesia received a record $8.3 billion in foreign direct investment last year, it lagged behind the $92 billion haul for China and $33 billion in India. Almost 33 million Indonesians, or 14.2 percent of the population, live on less than $0.65 per day, down from 16.7 percent when Yudhoyono was elected in 2004. He had targeted cutting the poverty rate to 5.5 percent this year. The Jakarta Composite index has climbed 54 percent this year, third best in Asia behind benchmarks in Shanghai and Sri Lanka. Indonesia’s $433 billion economy has skirted recession unlike many Asian neighbors that rely more on exports. Gross domestic product expanded 4.4 percent in the first quarter from a year earlier, compared with a 6.2 percent contraction for Malaysia and Thailand’s 7.1 percent slump. Per capita income doubled in Yudhoyono’s first term to $2,237 last year, according to the International Monetary Fund. Cash handouts to 18.5 million households helped sustain his approval rating above 60 percent even as he cut fuel subsidies that strained government finances. The budget deficit will be about 2.5 percent of GDP this year, Finance Minister Sri Mulyani Indrawati said on June 30, compared with 7.6 percent in Malaysia. Yudhoyono has reduced the debt-to-GDP ratio to an estimated 33 percent from 57 percent in 2004, according to the Finance Ministry. The country’s 17,500 islands span an area wider than the continental U.S., creating transport bottlenecks that have restrained growth. Still, Indonesia’s unemployment rate of 8.4 percent is the highest in Asia. About 32 million people live on less than 70 cents a day, according to the government. The nation’s ranking in Transparency International’s corruption-perception index remains lower than Nigeria and Costa Rica. With natural resources like palm oil, coal and nickel, Indonesia benefited from a China-driven commodities boom...Indonesia is the world’s largest palm oil producer and the biggest exporter of power-station coal. Indonesia is re-emerging as one of the world's hottest developing economies, a remarkable turnaround for a country that was once widely viewed as a basket case. Much of the credit goes to Indonesia's president Susilo Bambang Yudhoyono, a former army general who is widely expected to win re-election after five years in power. Under his watch, the government has stamped out Islamic terrorism and ended its civil war in the resource-rich province of Aceh. He has brought state spending under control and launched a popular anti-corruption drive, landing a number of senior politicians and central bank officials, including one whose daughter is married to Mr. Yudhoyono's son, in jail. Mr. Yudhoyono said that if he's re-elected, he will fill his next cabinet with technocrats, rather than hand out positions to a wide range of under-qualified leaders from rival political parties, as he did to placate opponents in his first term. He acknowledged that in the past his government has included businessmen with conflicts of interest that made it harder for him to rein in corruption and push reform -- a practice that he pledged to end in a second term.